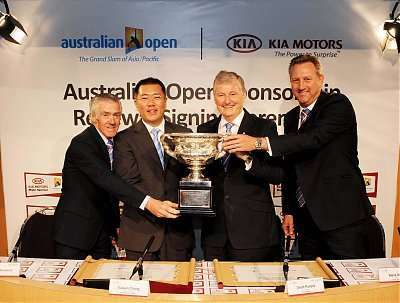 Kia Motors Corporation has extended its multi-million dollar sponsorship of the Australian Open tennis tournament as the major sponsor until 2013 in a new deal which includes broadcasting the tournament to public locations in China as well as Australia. The five-year extension, signed the day before the men's final at the 103 rd Australian Open, deepens the efforts of both Kia and the Australian Open to increase participation by amateur tennis players throughout the world. To widen the appeal of the Open to folks unable to be spectators courtside within Melbourne Park, three big-screen public broadcasting sites - Kia Live Sites - are planned for Shanghai at Century Square in Nanjing Road (one of the world's busiest shopping streets); outside the Melbourne Park precinct; and at the Overseas Passenger Terminal located near the Sydney Opera House. Euisun Chung, President and CEO of Kia Motors Corporation, said, "The excitement and passion we have once again seen both on and off the court, as well as behind the scenes, is the very reason why Kia Motors identifies with the tournament and wants to renew its commitment until 2013. The Australian Open is a great global entertainment event and has huge potential to grow." "Kia wants to help sustain and develop this same passion and excitement for the wonderful world of tennis amongst new and existing fans and players throughout the world." In the renewed deal, which is Kia's longest standing major sports sponsorship, the popular and fun 'Kia Fan of the Tournament' and 'Kia Fan of the Day' competitions, introduced in 2006, will evolve into global internet-based public voting competitions. The growing success of the Kia Australian Amateur Open, which in its fifth year in 2008 saw 5,286 players from 14 countries participating, will continue to play a major part in the sponsorship package. In addition, other established elements of the programme will continue including the supply of tournament vehicles for safe and convenient transport of players, support teams, officials and media to and from Melbourne Park. Tennis Australia CEO Steve Wood said, "Since Kia first sponsored the Australian Open in 2002, it has worked hard to engrain itself further into the sport and build a sustainable partnership not just with this tournament but the game of tennis as a whole. "The continuity of our relationship is our strength and we look forward to building on our successes and continue to grow the Australian Open global brand." The Australian Open was Kia Motors' first ever major international sports sponsorship. Since 2002, the company has deepened its relationship with tennis through its official worldwide sponsorship of the Davis Cup until 2008, and by adopting as global brand ambassadors tennis stars such as Andre Agassi in the past, and Rafael Nadal at present.